On a scale of 0 to 10, how likely are you to refer CFI to a friend or colleague? What is CFI’s Net Promoter Score (NPS)? As of March 2019, CFI’s 30-day Net Promoter Score (NPS) is 74. This rating was issued by delighted.com, an independent third-party surveyor. The survey was displayed to 1,704 students with 409 (24%) responding and 131 (32%) commenting. How is CFI’s NPS Calculated? Calculating CFI’s NPS score is done by adding up the total number of responses and subtracting the “detractors” from the “promoters”, on a percentage basis. The NPS score is expressed as a whole number that ranges between -100 (worst) and 100 (best), which indicates how happy customers are with your brand experience. In CFI’s case, the score of 74 means that 74% of students rate the financial modeling, finance and accounting courses as a 9 or 10 out of 10. Promoters are anyone who answers 9 or 10. Promoters are anyone who answers 6 or lower. Technically, anything above zero is “good” because it means more of the customers are promoters than detractors. 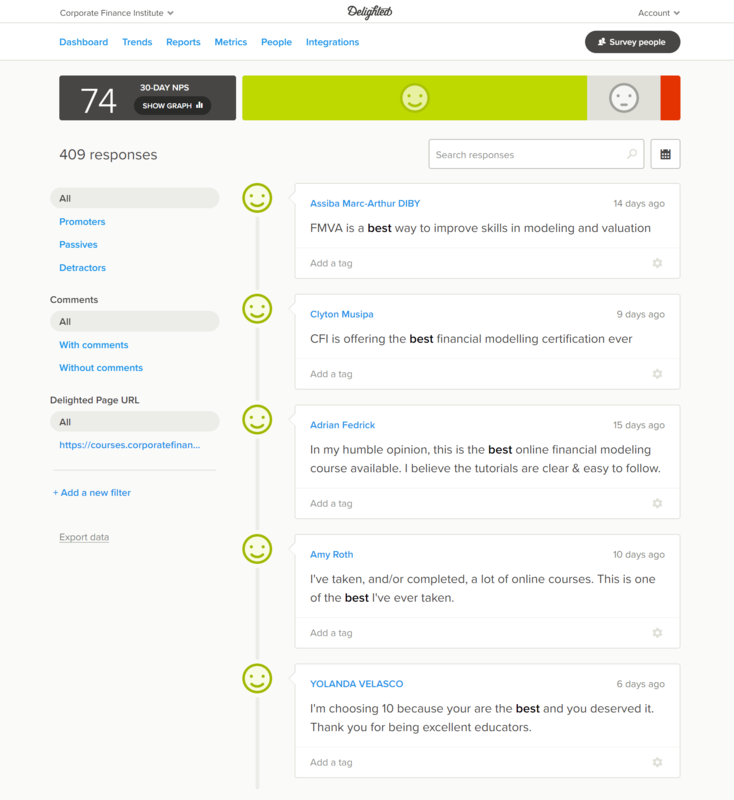 According to HubSpot, a score above 70 is considered world-class or “the best of the best”.